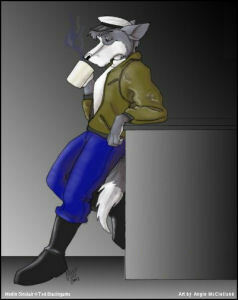 Merlin Marcus Sinclair is an anthropomorphic wolf from Ted R. Blasingame's science fiction series, Blue Horizon. The name originated in 1992 in an unrelated space Esper story named The Daughters of Herdantes, a proposed sequel to his space opera novel Treasure Hunt. Only a few chapters were actually written of Herdantes and the story was never completed. Then in 1996, Blasingame resurrected the character name as the protagonist of a new anthropomorphic serial Blue Horizon, which ran from 1996-2009, spanning forty-three tales in the series. The origin of this character name came about as an amalgam of two sources. Rather than from Arthurian legend, this "Merlin" came from a Disney film character, Merlin Jones, and "Sinclair" from the numerous Sinclair Gas stations in the area of the author's central Oklahoma. Coming Soon: commissioned art images, cartoons and character information data.